Nothing beats the mountains in snow season. We are convenient to downhill and cross-country skiing, snowboarding and snowmobiling. People come to postmark their Christmas cards in nearby Bethlehem. 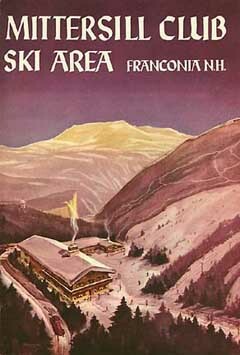 There is recreational skiing, serious ski competitions including local rail jams. Snow season has a grand finale with fun events such as the annual ski to work race where entrants must wear a jacket with a tie and carry a briefcase. The sap begins to flow and maple sugaring begins. In early spring, as the snow slowly recedes, the humor rises. There are the bathing beauty ski contests where contestants in bathing suits ski downhill and try to clear a pool of water a shallow hollow at the bottom. As the lakes thaw, fishermen rush to catch the hungry big ones that wintered over in the depths. Spring brings the lilacs, the famous Sugar Hill lupines, and the incomparable alpine wild flowers. The Mt. Washington Auto Road opens for the season. The motorcyclists rally in Laconia for nine days and the road race to run up Mt. Washington occur in June. New Englanders have been summering in the North Country for a hundred years or more. The balmy, clear mountain air gives welcome relief to the heat and humidity back home. There is the full range of traditional summer activities plus scenic train rides. In August there is the local triathlon "Race to the Face." Contestants bike from Franconia to Echo Lake, swim Echo Lake and run up the steep, nearly vertical ski slopes to the top of Cannon Mountain. The antique auction season is in full swing and the resident poet is at the Robert Frost house. Antique cars rally at the Mt. Washington Hotel. It does not get more beautiful then the North Country in the fall. The breathtaking orange, red and gold leaves of New England have inspired photographers for years. It is time for the annual harvest festivals of fall and country fairs. Pumpkins and apple cider add zest to this colorful season. Now it is the bikers' turn to pedal and race up the Mt. Washington Auto Road. After the leaves come down, it is time to read by the cozy fireplace in the lobby, select a Christmas tree at the Rocks Estate and find unique gifts for the holidays at the New Hampshire League of Arts and Crafts. Hunting season begins in earnest when the trees are bare.